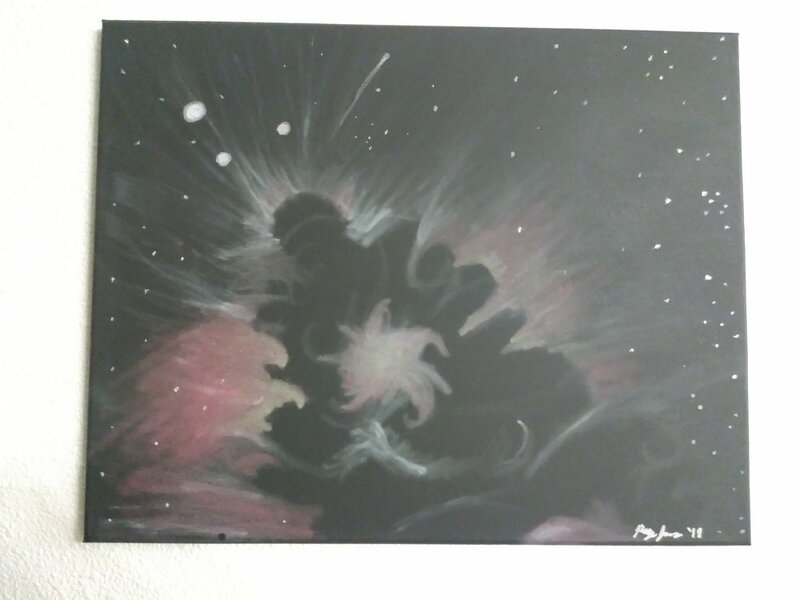 Nupastel on black painted canvas. Available at KB comics at the Citadel Mall in Colorado Springs. Inspired by a strange plant emerging from the sidewalk (which I have yet to identify). Available for sale at Piazza Novona Art Gallery in Manitou Springs. Available at KB comics at the Citadel Mall, Colorado Springs. 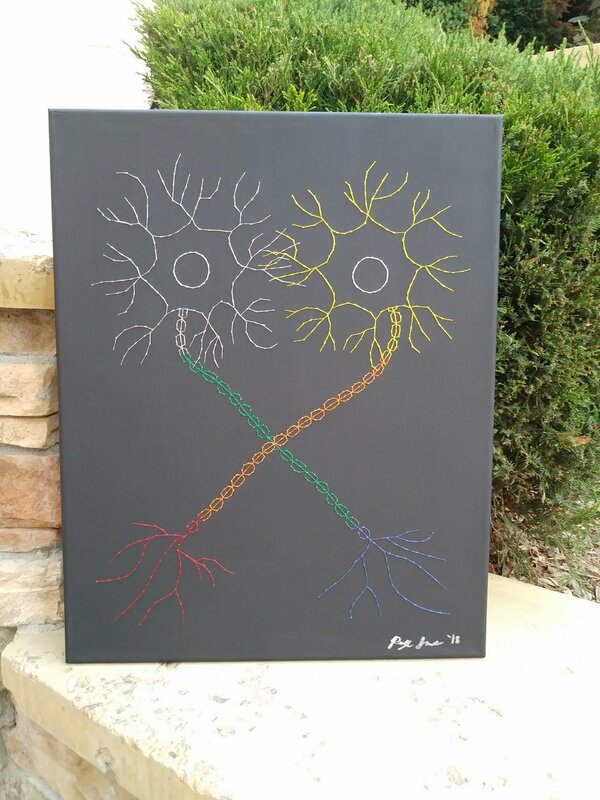 This is my largest neuron to date; 3 feet by 4 feet. Despite its minimalist appearance, the hand done thread work took over a month to complete. A close up view of the nucleus. Thread and black acrylic paint on canvas. 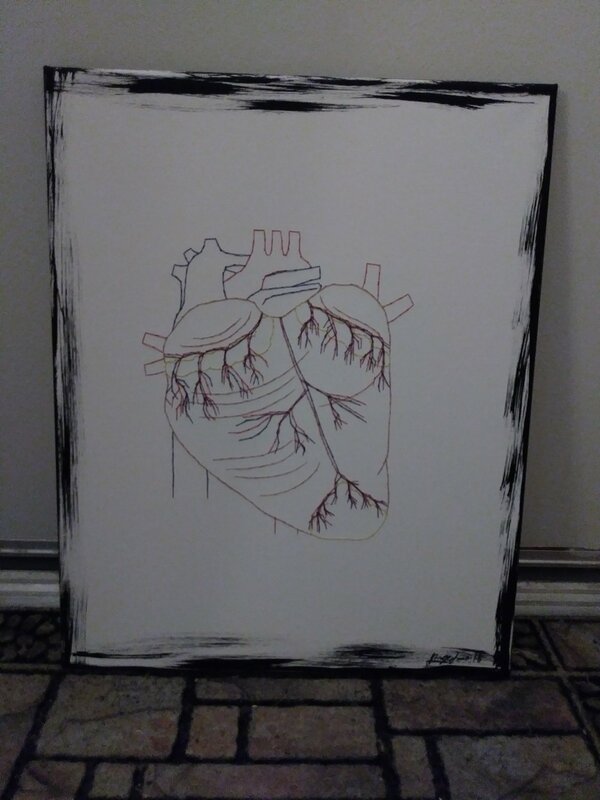 I researched “human heart” so many times for this piece, I feel like Google has placed me on some sort of “watch this one carefully” list. signature pieces were usually depictions of pears. 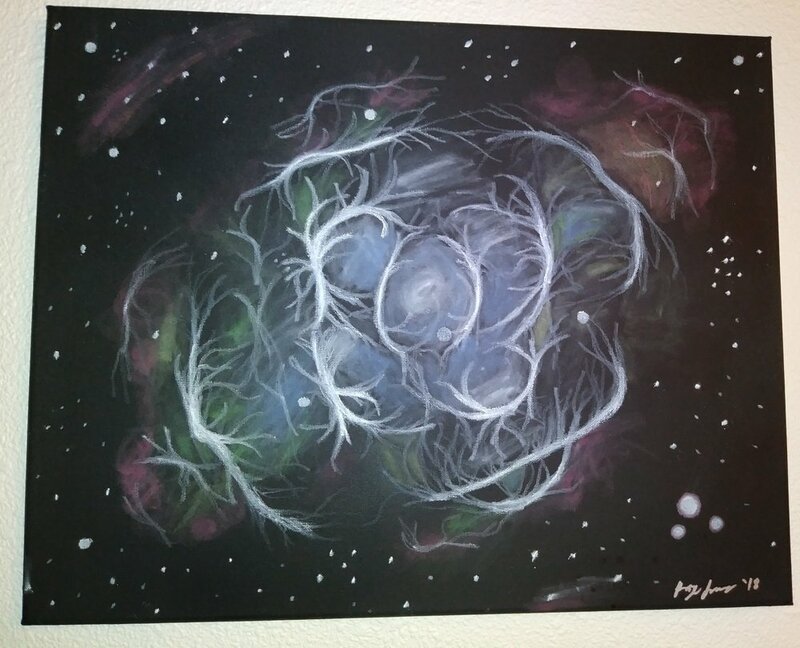 When I made this piece, I could only think of him. Currently available for sale in the hallway gallery at Curves in Woodland Park, Co. Inspired by mandalas, which represent the universe. field. Gold shapes dance across the backdrop. I began studying psychology not only because I find the human mind fascinating, but also because I wanted to help people. Working in a mental health clinic, however, taught me that you can't fix everyone. This picture depicts a figure on the left who is at a high point in their life. They see another figure on a dark and jagged peak, and try to reach out to them with words of comfort. By the time the words reach the other figure, however, they seem as jagged and cold as the peak they sit upon. Metallic thread on painted canvas. Trilobytes were amazing creatures. These many legged, many ribbed creatures are considered one of the more successful species that have inhabited the earth. I tried to catch the eerie beauty of a trilobyte fossil in this piece. Currently available at KB comics at the Citadel Mall in Colorado Springs. Thread on Canvas. This one I just made for fun. I took a literal approach to the tulip and a subjective approach to the sunlight. Watercolor, raw pigment, and metallic thread on canvas. This piece was inspired by a fossilized group of crinoids displayed at the Houston Museum of Natural Science. Though these look like some kind of underwater flower (hence their other moniker, "Sea Lilies"), they are actually animals. Crinoids can be found in stalks like these, but they can also become free floating "Feather Stars" . This piece is quite large; 4 feet by 3 feet .